This annual raffle supports SNAG’s Educational Endowment Fund. SNAG’s 2019 raffle will be held during The Loop: Coming Full Circle conference in Chicago, May 22-25, 2019. Great prizes! 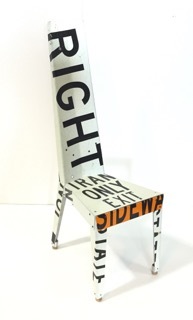 Including Transit Chair, Humanufactured® (hand-fabricated) of recycled aluminum traffic signs, champagne corks and steel hardware. Value: $1150. $20 each or six for $100. Credit cards only, no cash or checks. Drawing will be held at the conference. You do not need to be present to win.